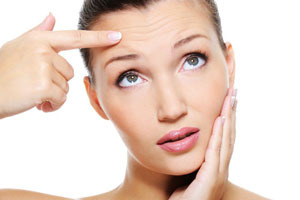 A wrinkle is a fold, ridge or crease in the skin. Skin wrinkles typically appear as a result of the aging processes resulting in a thinning of the epidermal layers of the skin as they lose the ability to retain moisture. Wrinkling in the skin is caused by habitual facial expressions, aging, sun damage, smoking, poor hydration, and various other factors. Depletion of water in the body, as occurs with dehydration, can also cause this puckering of the skin. The dermal layer of the skin thins and produces less and less collagen over time. Underlying the dermal layer of the skin is the subcutaneous layer which consists of fat cells which shrink with age and become less able to support the upper layers of the skin which make wrinkles even more noticeable. Because of the degradation of the skin over time, the required regimen for treatment is a preventative protocol. The Dermapen® promotes a process of new skin growth through the science of Collagen Induction Therapy (CIT). The most effective way to stimulate or “Induce” new skin is by micro-needling with the Dermapen’s® vertical stamping method. This new stimulation can be done quickly and easily while keeping the epidermis intact and down-time to a minimum. Skin conditions are different as well as the age of each patient. Dr. ChinQuee will consult with you on a prescribed treatment that is customized for your skin condition. Scars are areas of fibrous tissue (fibrosis) that replace normal skin after injury. A scar results from the biological process of wound repair in the skin and other tissues of the body. With the exception of very minor lesions, every wound (e.g. after accident, disease, surgery) results in some degree of scarring. Scar tissue is the same protein (collagen) as the tissue that it replaces, but the fiber composition of the protein is different. Instead of a nice “basket weave” formation of fibers, the collagen in scar tissue is aligned in a single direction resulting in a pronounced and thicker appearance. How to treat acne scars/ surgical scars. The Dermapen® treatment can provide dramatic results improving the appearances of the scars. The physical nature of “skin-needling” breaks up this fibrous and uneven scar tissue and stimulates the growth of new tissue. Dermapen™ creates new collagen and elastin to be generated and deposited called collagenesis. 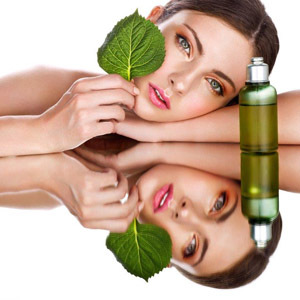 New capillary growth is also a result which can improve blood supply to the area which helps create healthier existing skin as well as provide a healthy foundation for the new skin. Currently there are ablative and non-ablative treatments offered which can damage the epidermis and evaporate the skin leading to thinner epidermis problems. The Dermapen® keeps the epidermis integrity fully intact while treating the area which speeds up healing time and causes less pain, and leads to a thicker, healthier skin. A surgical scar is a type of injury to flesh caused by surgery, usually incision, that requires the modification of all layers. Because a surgeon cannot control all the factors that determine a scar’s appearance, treatment after the surgical area has properly healed is sometimes necessary. The challenge in treating a surgical scar lies within the matrix of categories and qualifications of scar tissue, such as whether the scar is hypertrophic or keloid, or whether there are pigmentation flaws. These scars thicken over time. Unfortunately, scar therapy in general has been historically limited. Dermapen™’s unique vertical stamping and depth control up to 2.5mm makes treatment of surgical scars with the Dermapen™ device superior to other methods. With surgical steel integrity, the robust automated needle tip (11 needles total and sized at 33 gauge) penetrates difficult scar tissue, dramatically improving appearance, texture, elasticity, size and mobility. Surgical scars have a physiology that is different from other skin conditions. Multiple treatments will be needed at varied depths, depending on the severity and type of scar, to see desired results. According to Wikipedia, stretch marks or striae (singular stria), as they are called in dermatology, are a form of scarring on the skin with an off-color hue. They are caused by tearing of the dermis, and over time can diminish but not disappear completely. 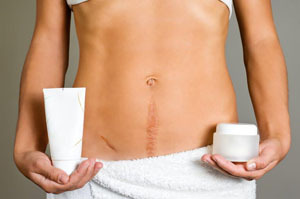 Stretch marks are often the result of the rapid stretching of the skin associated with rapid growth. Stretch marks may also be influenced by hormonal changes associated with puberty, pregnancy, muscle building, hormone replacement therapy for transsexuals, etc. Medical terminology for these kinds of markings includes striae atrophicae, vergetures, stria distensae, striae cutis distensae, striae gravidarum (in cases where it is caused by pregnancy), lineae atrophicae, linea albicante, or simply striae. The use of the Dermapen® uses the body’s natural regenerative capacity to treat unsightly stretch marks. New collagen stimulation and growth is a highly effective way to reduce and fade the appearance of stretch marks. Dermapen® does this through Collagen Induction Therapy (CIT). The Dermapen® device allows for adjustable needle depth to activate fibroblasts and stimulate new collagen and elastin formation. The new collagen and elastin results in smooth and healthy skin. The skin of the epidermis effectively thickens and is noticeably smoother, which evens out stretch marks as a result. Dr. ChinQuee will consult with you on a prescribed treatment. Most patients see a noticeable difference in just one treatment; however 5-8 treatments may be necessary. After 5-8 treatments striae improvement is highly noticeable with improved texture and appearance of mature, white striae in skin types I-IV. Four to six weeks between treatments is necessary to allow the body’s natural skin cycle to complete before another treatment should be performed. The challenge of a burn scar lies within the matrix of all the forms or categories of the scars involving whether the scar is a hypertrophic or a keloid scar or whether there are pigmentation flaws. These scars thicken over time. Burn scar therapy has been historically limited. The Dermapen’s® unique vertical stamping and depth control up to 2.5mm makes treating burn scars superior to other methods. With surgical steel integrity, the robust nature of the automated needle tip (11 needles total and sized at 33 guage) penetrates difficult burn scar tissue, dramatically improving appearance, texture, elasticity, size and mobility. Burn scars have altered physiology compared with other skin conditions. Multiple treatments will be needed and vary depending on the severity of the burn scar to see desired results. Dr. ChinQuee will consult with you to individualize a treatment regimen.